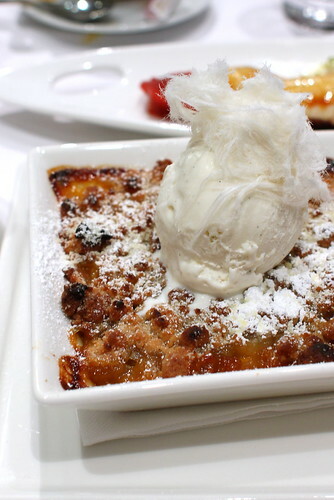 Life cannot be better when you can spend a wonderful Sunday afternoon with 3 lovely ladies over Brunch + Desserts! It certainly made the my day before Monday less miserable. I wish every Sunday can be the as eventful but of course at different venues. 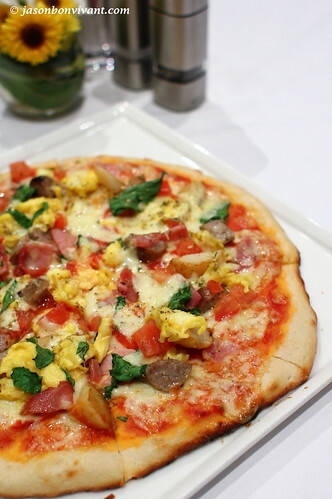 The culture of Sunday Brunch has been trending over the last few years in Hong Kong based on my observation especially with the number of establishments offering such menus. However, there are only a handful to be honest and there are more people like myself who are getting used to getting up late over the weekends and then head for brunch. Another interesting thing I realized is that people heading for brunch nowadays are increasing more causal, particularly ladies who obviously choose not to put any make up on. Don't get me wrong but I am just surprised, that's all. Located in the middle of the older district of Hong Kong in Sheung Wan, Oolaa exerts quite a different atmosphere and scenery compared with the surrounding setting. Half pub and half dining area, it clearly tries to suit different crowds at the same time on any given day. It was quite a walk to reach there from Central so I was pretty hungry by the time I arrived. As soon as we were all settled down in the dining area, it was time to order! I ordered the Breakfast Pizza because I was curious about. I may not seem like an adventurous person but when it comes to food, I can be! The price I have to pay for being curious was ... carbs overload! With potatoes chunks and cheese as toppings, even for a potato and pizza lover like myself it was a bit too much. 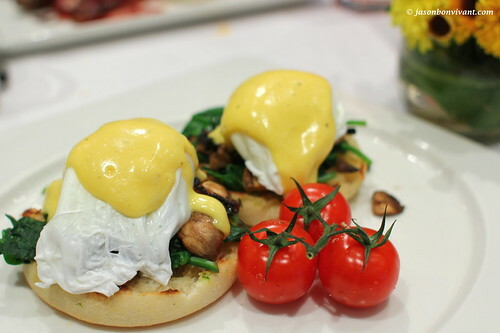 The Eggs Benedict (buttered baby spinach and button mushrooms) was love at first sight. At least its look! So ... round and so clean-cut with its presentation. The cherry tomatoes were asking me to eat them in one single bite! The poached eggs had running yolk coming out as soon as I put my knife into it but the whole dish was not of optimal temperature when served. I was a little disappointed with food temperature to say the least but in terms of flavor, the combination of butter spinach and mushrooms together with the eggs more than compensated the shortfall. 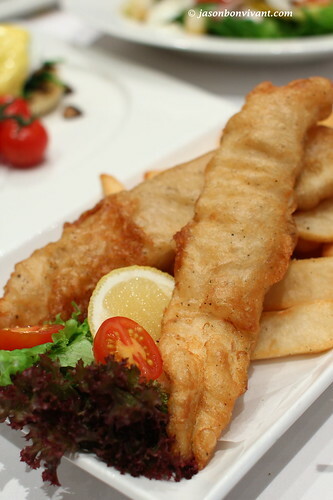 The Beer Battered fish and chips was ... boring but it certainly reminded me about my trip in London a few months ago. Batter was a bit too thin to my liking and the shape of it was ... more like fish sticks. I like my fish in one big slab served on newspaper (FT preferred haha). 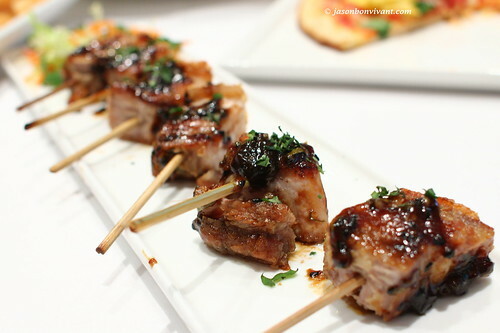 Pork Belly Lollipops with a spicy Hoisin BBQ sauce. You are right, the word Lollipops got my attention already and I had to be ordered! H encouraged me as well! :) As the name suggested, it was basically pork belly on stick. Sorry actually, with the Hoisin BBQ sauce, it was Chinese style Pork Belly on a stick to be exact. A truly Chinese inspired lollipop. Savory lollipops. Oh right, the skin was quite crispy but the Hoisin sauce was slightly overpowering indeed. Hello Oolaa Cheescake Crunch! 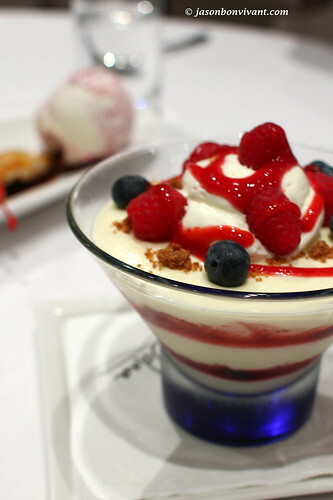 It was more cheesy than I expected and rather refreshing as well with berries on top. Hello Strawberry Pavolva! Should I or should I not eat you right away???? It was huge! 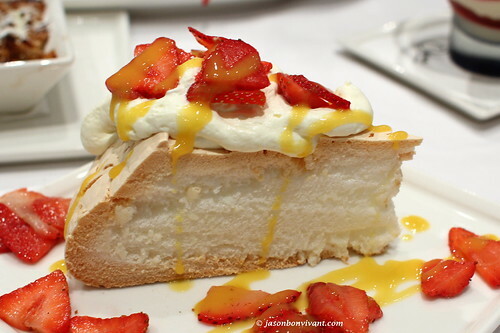 The sauce and the sliced strawberries were a bit too tangy for me but it was a light and fluffy Pavlova nonetheless. Nice to meet you Mango Crumble! But I like your cousin Apple Crumble more! I am sure it was quite difficult to make because mango generate greater amount of moisture when cooked. The crumble part was nice but it was the entire piece that matters. If you are a mango fan and like to try this, do give it a try. I wasn't sure what inspired the Banana Split here but I did like it! Let's be fair, yes they did warn me saying that it was COMPLETED DE-CONSTRUCTED, but still! They should have named it differently or perhaps burlee the banana a bit more because it was more like sauce to me. Bye Bye Banana Split! I now welcome S'mores!!!! Huge plate of it as well! Quite funny the way they presented it but I liked how I got to figure out by playing! Yes, I do play with my food as you can see by now. Note: It is not for the light hearted because having this at the end of a full meal requires the courage and stomach and appetite of a lion! unless you are like me who self-claim to have 4 stomachs! It was hard to go wrong by dipping a Graham cookie into the chocolate dipping and then the torches marshmallow and top it with another cookie. 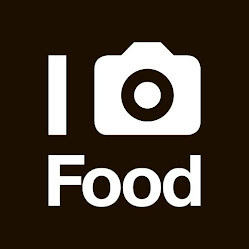 Actually, I think you can eat it however you like it, it is hard to go wrong. Invent your own version of S'more, completely de-constructed if you like! But in any case, No matter how creative you are, it would not be the same when you are not making S'mores over campfire!! Atmosphere is quite relaxing during the weekend, can be quite noisy as well in the bar area but some prefer it that way especially when a game is on! 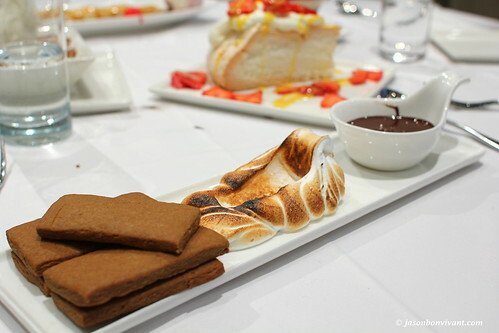 omg, a place that serves smores!!?!!! i'm in heaven!! Jason - you are indeed a very lucky guy to be brunching and having yummy dessserts (yes, pavolva and S'mores, I'm talking about both of you) with 3 lovely ladies! One to add to my list of places to try in 2011 - thanks for sharing, Jason! 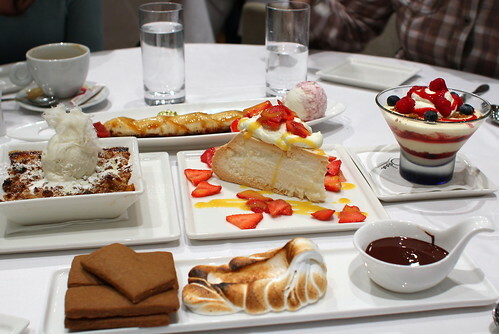 And the last photo is such a lovely eye candy, desserts!!! Suzanne's weakness! @Cheeky Angel: you are too welcome! are you ready for the Wings Gathering??? 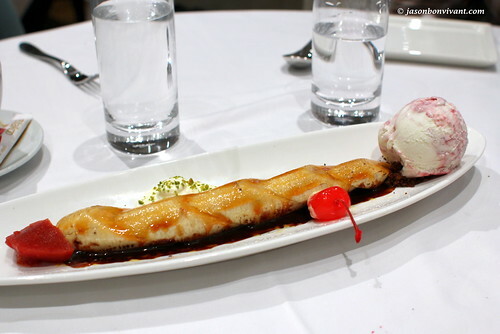 @Suzanne: My soft spot is always desserts, anything with alot of sugar would do as well! @ Jason: When and where? Although can't really cook but can eat! Hahaha! Jason, great pictures, thanks. I think eggs benedict must be a tricky thing for a restaurant to get right... and it's so disappointing to get cold food. :( The cheesecake crunch looks the best to me. Yummy. I LOVED the banana split! But to be honest, my first choice was the strawberry pavlova (I'm an Aussie) but it was not available that day. My friend ordered the s'mores and it was waaaay filling, particularly because the 'graham crackers' were much too thick and stodgey. We thought that the waitress should have mentioned it was enough for two-ladies-who-were-lunching. @Sarah: yeah! it is really hard to get benedict right, it requires skills and experiences as well I think. I really want to be able to make a good one myself!